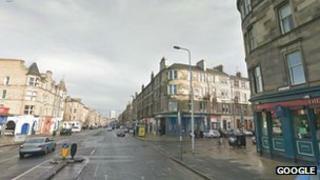 A man is recovering from serious facial injuries after he was attacked by four men in Edinburgh. The 34-year-old was on Leith Walk at the Dalmeny Street junction at 23:45 on Friday when he got involved in an argument with people in a passing car. The four men got out of the car and assaulted the man, before driving off on Dalmeny Street. The attackers were described as Asian in appearance. The driver is in his early to mid 20s, of skinny build. He was wearing a bandana or hat, a black top, and blue jeans. The car is described as a sporty metallic silver Honda Civic, possibly three-door. The man was taken to Edinburgh Royal Infirmary for treatment. Det Sgt Jonathan Wright, of Police Scotland, said: "The victim has suffered serious facial injuries as a result of the assault, and we are keen for any information that can help us trace the suspects. "We want to speak to anyone who witnessed the assault, or who saw the Honda Civic being driven in the area at the time. "Likewise anyone who recognises the description of the driver, or who has any other information that can assist our enquiries, should also get in touch."